After a month in the US, it was time to come home. I’d flown to Miami (in the back of an A380), spent a week driving around Florida’s east coast (interesting, but very flat), attended back-to-back week-long meetings in Miami and Phoenix (including flying first class between the two), then had a final week driving around northern Arizona, largely basing myself in Flagstaff. This was easily the best part of the trip, with mountains, canyons, forests and deserts all within an hour or two’s drive of Flagstaff. There was even an unexpected find of some great coffee. You can find out how I got on after the gallery. Left to my own devices, I dislike getting to airports early. I find all the hanging around extremely frustrating, particularly since most airports really aren’t well set up for it. However, in the case of Sky Harbor, I deliberately went early to pay a visit to Cartel Coffee Lab. I came across Cartel on the equivalent trip last year when I visited the coffee shop/roastery in Tempe, and a smaller branch in the very centre of Phoenix. One of the nice things about Sky Harbor is that it welcomes lots of local restaurants and other businesses, rather than focusing on the normal chains, and this includes Cartel, which has a coffee shop beyond security in Terminal 4. I wanted to go in 2016, but back then, Cartel closed in the evenings, whereas now it stays open much later, making a visit a must. I’d already called in when I flew into Phoenix, but I had to collect my bag from the baggage reclaim, so couldn’t stay long. To ensure I had enough time for a proper visit, I’d arranged to return my hire car at 17:00 and, for once, was on time. Everything went very smoothly and before long I’d caught the bus over to the terminal. By 17:40, a whole three hours before my flight, I was through security and had headed over to the C gate area (Terminal 4 is arranged as rectangle, with the entrance/exit in the middle and four gate areas, A through to D, around the outside). Despite spending an hour at Cartel, I still made it to my gate, B25, by 18:40, still with two hours to kill. However, since I was flying business class, I finally had time to relax and enjoy the lounge, a lovely little affair down by the gate. As far as I could tell, ours was the only flight leaving at that time of the evening, so we had it to ourselves. The lounge was split into two, a seating area on one side, serving coffee and snacks, and a more food-orientated area on the other, with a cold buffet and a full bar. We even had our own barman, Brett, who shuttled between the two areas, ensuring everyone had drinks and generally keeping us all entertained. While I’ve been in lounges with better facilities, I don’t think I’ve been in a friendlier, happier or more relaxed lounge. I helped myself to the buffet, chatted with Brett, did some work on the laptop and generally passed the time before we had to board. If I had one complaint it was that the air conditioning was on full blast, so it was quite chilly in there. Since it had been 20⁰C that day, it was a bit of a shock to the system, but then again, you could say that after four weeks of weather that would pass muster as a British summer, the lounge was just acclimatising me for my return to winter and the UK. The flight was supposed to leave at 20:40, but was slightly delayed, another advantage of being in the lounge: since we were the only flight, you could pretty much hang around until the flight was called. It wasn’t as if anyone was going to get left behind. As it was, we were called down at 20:30 and everyone rushed out, while I took my time, packed up and chatted with Brett. Faced with 10 hours on the plane, I couldn’t quite see the hurry to be first on and add another few minutes to my confinement. Despite my tardiness, when I wandered down to the gate, they still hadn’t started boarding business class, so, for the first time when flying in the front half of the plane, I had to queue up to get on, although it definitely justified my decision not to hurry! Although I’d flown out in economy, I’d always intended to fly back in business since it was an overnight flight and I had the budget for it. Compared to the difference between economy and business on the flight to Miami, which had been more than £2,000, upgrading to business class was a more reasonable (but still expensive) £1,650. I’d learnt my lesson when I flew to Chicago over the summer and tried to upgrade my return flight. That time, I’d booked the flight through Expedia and while I did manage to get the upgrade, it was unnecessarily complicated. This time I booked direct with British Airways, although even that wasn’t as straightforward as it could have been. In an ideal world, I’d have been able to book different classes on the various legs, but while you can do that for a simple return flight, you still can’t for multi-city or open-jaw flights (one where you fly into one city and out of another). So I booked the whole flight in economy and then called British Airways to upgrade the return flight from Phoenix. This is where I ran into a slight snag, which is worth knowing about. Technically, the economy flight I booked was non-refundable/non-flexible, so even though I was trying to pay British Airways an extra £1,650, I was still charged a £150 change fee, which I think is outrageous. There’s one saving grace: if you make the change within 24 hours of booking, the fee will be waived, but you have to know to ask, otherwise you’ll be charged regardless, which I think is outrageous too. The Phoenix route (along with Chicago) is one of the last where British Airways still flies Boeing 747s. Having flown back from Chicago in business class, I thought I knew what to expect, although the cabin was subtly different, the result (I think) of the plane being slightly older. The seats are still arranged in pairs, one facing forwards, the other backwards, with one pair by the windows on each side and two pairs in the centre. The seat felt a little narrower, but that may be my memory playing tricks, although it was definitely narrower than the more modern business class pod seats I had when flying with Vietnam Airlines and China Eastern. The plane also lacked features such as Wifi (no great loss) while the fold-out TV screen was much smaller than the one on the flight back from Chicago. On the plus side, since I wasn’t planning on watching anything, it meant I could easily work on the laptop while having the screen out, so that I could keep an eye on the map throughout the flight. This time I was assigned a window seat, 20A, which is right at the back of the business class cabin, and, in my opinion, is one of the best seats on the plane. Even if there wasn’t much to see, I did enjoy the novelty of having a window given that I normally fly in aisle seats. Being in a window seat was akin to being in the more modern pods when it comes to privacy/cosiness, since the fuselage is on one side, with a seat on the other. The sense of privacy was enhanced when the dividing screen between the two seats was raised, leaving me cocooned in my own little world. The seat was a little harder to get into/out of, since I had to duck due to the overhead bins, and there wasn’t much of a gap between the bulkhead and the back of seat 20B (my pair, facing forwards). That said, a major bonus was that I could get in and out without climbing over anyone. In every other window/centre seat, rather than having a bulkhead behind you, with room to squeeze out, you have the next seat, forcing you to climb over the outside seat. This is fine while it’s still a seat, since you can just squeeze by the footrest, but once it’s been turned into a bed, you do literally have to step over it, which is not ideal. There were all the usual seat controls, while the table folded down and then out again. It was okay, but I’ve had better/more stable tables. However, it was a good size, certainly big enough for my laptop, while it could slide back and forward a long way (maybe three times its depth) so there was never any problem getting it at the right position for typing. The reading light is, unusually, in the moulding of the seat, behind me to my left in this particular seat (I had to ask the cabin crew where it was though!). I liked it there, finding it illuminated the seat nicely, while it also lacked the harsh, headache-inducing quality of some of the more modern reading lights. It could also be dimmed by means of a slider (which doubled as the on-off switch) which I appreciated. And finally, the angle could be adjusted, all of which added up to a superior light. Sometimes modern doesn’t mean better! You can see what I made of the flight itself after the gallery. Although we were delayed in boarding, we got on the plane very quickly and, by 20:50, the doors were closed. We pushed back at 20:55 and, after the obligatory 20 minutes of taxiing, took off at 21:15. The flight from back from Phoenix always surprises me. Scheduled for 10 hours, the pilot was estimating a mere 8½ hours in the air, which isn’t much longer than the flying time back from Chicago! It also doesn’t leave much time for sleeping! I know it really is a first world problem, but a 12-hour flight (as long as you’re in business class) is so much better! I was feeling surprisingly tired, particularly since I had got up relatively late (9.30) and it was still relatively early (21:30). It was, however, the end of a long, four-week trip, which might have explained it. In some ways, I regretted staying up for dinner, but I was very glad that I had eaten in the lounge, since dinner wasn’t served until 22:05. And, of course, since I was at the back of the cabin, I was served last. That said, I find it hard to turn down a three-course meal, consisting of starters, main course and dessert, plus a full bar. Even though I had a vegetarian meal pre-ordered, so technically didn’t have a choice, I appreciated having a menu, which offered a choice of meat, fish and vegetarian options. The food was good and, of course, ate up (pun intended) an hour of the flight. I rounded things off with a personal weakness of mine: a glass of port. After that, it was time for bed. At 6’2”, I’m pushing the limits of this type of lie-flat bed, but as long as I don’t expect to lie flat and fully stretched out, I fit just fine. There was another slight kerfuffle when neither I nor the man in the other seat could work out how the dividing screen worked. We thought it was broken, but in the end, one of the cabin crew pointed out what we were missing, the button on the top of the screen which mechanically lifted it into place. My main complaint with these types of seats is that there is nowhere to put my glasses, a complaint I had flying back from Chicago. A small shelf or pocket would do wonders. However, there was a handy drawer at the bottom of the pillar with the table and TV screen. This was more than big enough for my laptop and some other bits and pieces and while you couldn’t get at it once the seat had been turned into a bed, it did at least mean I had somewhere to store stuff while I slept. If there was such a drawer on the last 747 I flew on, I never noticed it! I went to bed at midnight and got about 4½ hours sleep, although perhaps it would be more accurate to describe it as a series of interconnected naps. Breakfast was served almost as soon as I woke up (I think that the cabin crew were keeping an eye out and then serving people as they woke). It was, by the way, very good. By the time that was done with, it was 5.10 (just gone noon UK time) and we had about an hour to go. We landed bang on (predicted) schedule at 13.10 UK time, at which point everything went very smoothly. I was out of the plane and through passport control by 13.35, and by the time I got to baggage reclaim, my two bags were waiting for me on the carousel, which was a very nice way to end the whole trip. 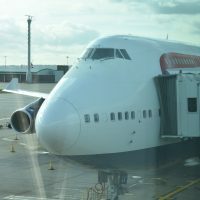 This entry was posted in Brian's Travel Spot, Phoenix and tagged Boeing747, BritishAirways, BusinessClass, USA2018-T01B by Brian Williams. Bookmark the permalink.